It’s not because I saw an almost age mate of mine, who grew up in the city where I was born, being captured, humiliated, tortured, auctioned and sold. Yes, sold. You read that right: SOLD. Just like an iPhone 6 you don’t want anymore. It’s not because most of them are from West Africa, where I’m also from. It’s not because I’m a son of an immigrant who risked his life to provide a better future for his family, coming to Europe in a similar way with those thousands of migrants who unfortunately ended up in the dark side of our local news. «During its investigation, CNN witnessed a dozen of men being sold at an auction outside of the Libyan capital of Tripoli. Some of them were auctioned off for as little as $400. Ultimately, CNN was told of auctions taking place at nine locations throughout Libya, but many more are believed to take place each month. Tens of thousands fleeing conflict or searching for economic opportunity cross into Libya each year, looking to be smuggled across the Mediterranean Sea. 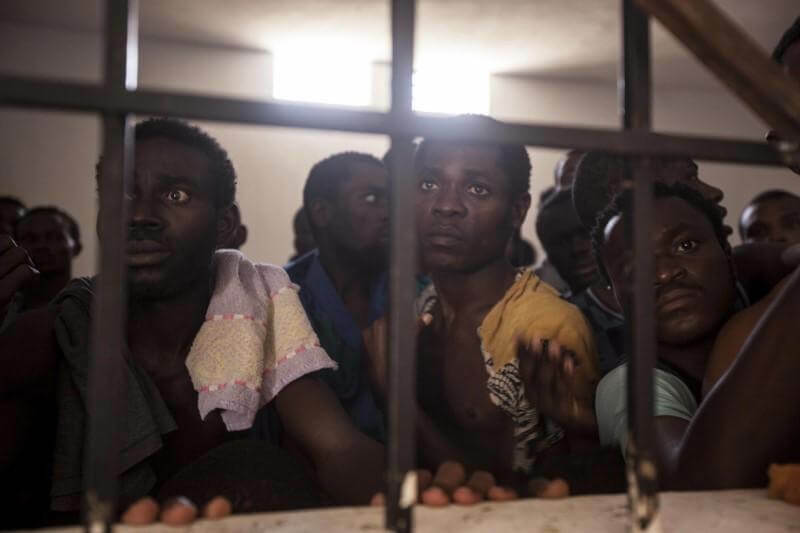 The United Nations estimates there are 700,000 migrants in Libya, and for years those who have crossed the Mediterranean have shared stories about beatings, kidnapping and enslavement». It’s because I’m a human being, living in 2017 but waking up to the news that took me hundreds of years back, to a cruel and horrific period of time, for which humankind is ashamed of and wants to erase. News that made me sick to my stomach, a terrible situation that got me mentally frustrated: fellow human beings are sold like common merchandise. Fellow human beings who, with hope of a better future, sold most of their properties and left their loved ones behind. Fellow human beings who had the courage to proceed into an unknown journey, aware of some of the risks this decision held. Fellow human beings just like you and me with dreams and ambitions for a better life for themselves and their loved ones. I don’t want to exaggerate, but this feels like hell. It’s 2017. How can we have people literally enslaved, people turned to nobodies with zero rights just in a second? How can this be going on, right under our noses? How can we have the United Nations and all of its laws, while this is still going on? How can we have so many different types of civil rights organizations, movements, human rights fighters and keep on allowing this devastating situation? It saddens me and it breaks me, thinking that humanity would reach this point just because of its greed for power, control and money. It has been almost 152 years since slavery officially ended in the United States of America, but we still have this brutal, inhuman phenomenon going on in our days. For years we have been taught in our History books about our very own forefathers, who fought for their rights and for their children to be free and treated equally. For years we have admired and felt grateful for the courage and persistence that Nelson Mandela had, the courage and wisdom Dr. Martin Luther King had, the courage and decisiveness that Rosa Parks had, the courage and boldness Malcolm X had. So it’s time we take an example out of the courage these heroes of ours had and come together as one to fight and make the world aware of this inhuman situation going on in Libya right now as we speak. Let’s show the decisiveness and persistence our heroes had, so we can help our today’s brothers and sisters who are being killed, abused physically and mentally, young, older brothers and sisters, going through all these inhuman things I don’t want to even think of. I know we all have things to do; we have our jobs to attend; our needs to please. But there are some times, times like these, when things are just bigger than that. This is a time we must all come together, because this is bigger than just us individuals, a time that it doesn’t matter where you come from and to which God you pray to, a time that unity and solidarity, joining our strengths for a greater purpose is very much required. This specific paragraph is directed to the African Diaspora in Greece. We have been through a lot. I know times aren’t easy. But we must come together now more than ever. In the name of Freedom for our Brothers and Sisters who started a journey to the unknown, just like most of our Fathers and Mothers. If it wasn’t for them, maybe it could be me or you trapped in a cell, brutalized, chained, crushed mentally and physically. That’s why we shouldn’t forget and we shouldn’t look the other way. We have to take matters into our own hands and sacrifice some of our precious time, when it comes to a far more precious purpose like this. We need to raise awareness, make these voices heard and make this situation known. Don’t let these people vanish in a cell, don’t be one of those staying aloof, not taking a stand, contributing in this way to the deep sleep of the public eye.